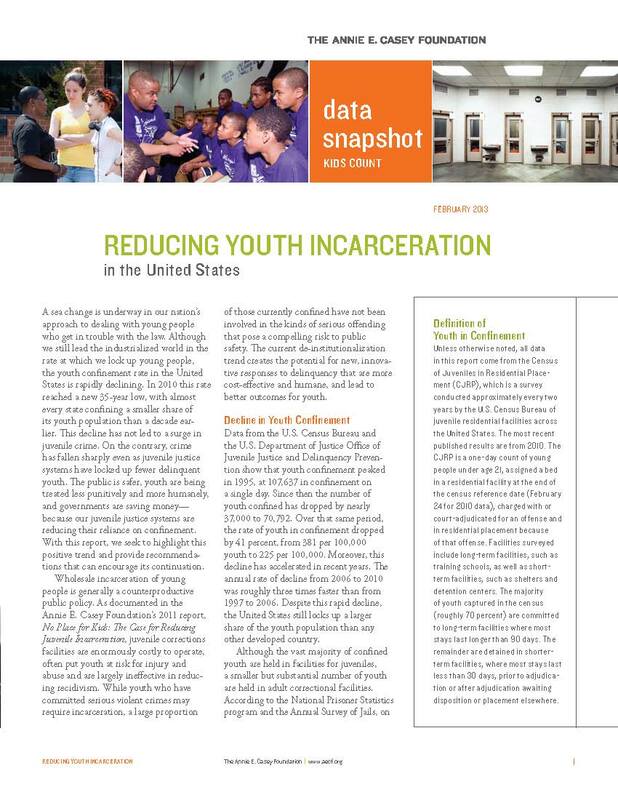 This blog post was originally posted on Reclaiming Futures' blog March 13, 2013 entitled "Two New Reports Show Juvenile Confinement Reform in Five States"
In almost every state, youth of color are held in secure facilities at rates as high as four and a half times their percentage of the population. For example, in 2010, African-American youth made up 16.6 percent of the under 18 population. That same year they comprised 40.9 percent of incarcerated youth in the U.S, a disproportionality ratio of 2.46 to 1. Just to be clear, this figure means that African-American youth are 2.46 times more likely to be incarcerated than we would expect if we used their percentage in the general population as a guide. And that’s just the national average. In 14 states in 2010, African-American youth were disproportionately represented in juvenile confinement by more than a factor of three. 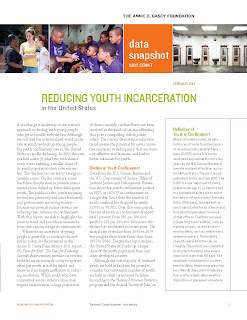 The issue has traditionally affected African-American youth but Latinos and other youth of color have begun to experience more juvenile justice system disproportionately in recent years. 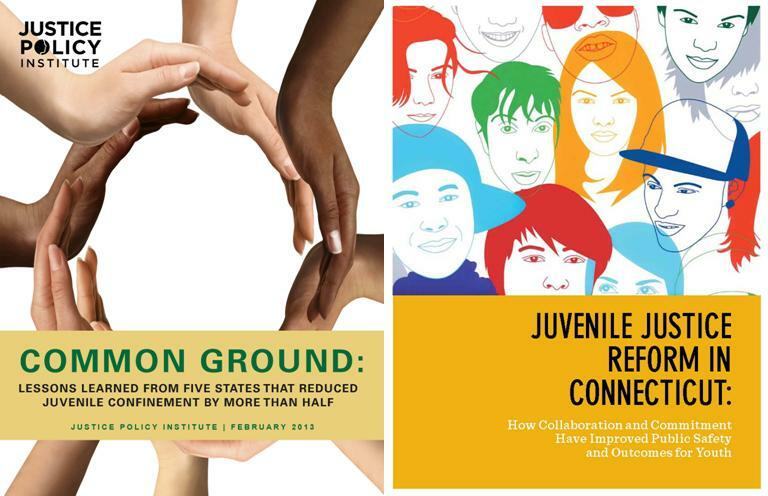 JPI’s recent report released Feb. 27, Common Ground: Lessons learned from five states that reduced juvenile confinement by more than half, found that, despite falling youth confinement rates nationally, disproportionate incarceration remains a problem in most states. In fact, even amongst states that have lowered youth confinement by more than half, the disproportionality of incarcerated youth of color has gotten worse. The problem isn't new or a surprise to politicians practitioners or advocates. It certainly isn’t news to confined youth of color whose cellmates are overwhelmingly various shades of brown. Disproportionality was mentioned in federal guidelines as early as 1988 in revisions to the Juvenile Justice and Delinquency Prevention Act (PDF). So why haven't decades of well-intended efforts solved or at least lessened the problem? Most likely because the decision to confine or not confine a young person of color 1) cannot legally or ethically be based on their color, and 2) that decision is too late in the chain of decisions that led to the youth's justice system involvement. In our American legal system there is no place for racially influenced decision-making (not to say it doesn’t exist). So the possibility of a mandate to incarcerate fewer youth of color upon adjudication is an impossible one. Even if tried, it would lead to cries of reverse discrimination. A judge must base their decision on other factors. Sadly, these other factors are ones for which youth of color are at a disadvantage. They come from communities and schools that are more likely to have a police presence, making prior citations or arrests more likely. Youth of color are more likely to be stopped for suspicion and less likely to be counseled and released than white youth. Youth of color who lack financial resources can’t afford legal representation, making pre-trial detention more likely which leads to a higher likelihood of adjudication (a guilty finding in the juvenile system) and incarceration. And it doesn’t stop there. Justice system involvement for youth increases the likelihood of adult justice involvement. Any level of involvement hurts families, communities, impacts educational attainment and burdens society. Spike Bradford is senior research associate for JPI. 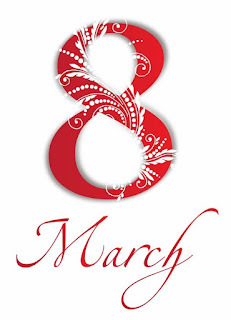 International Women’s Day is a global day of celebration of women as well as a day of resistance to all forms of gendered violence, exploitation and oppression. Women living behind prison walls are denied many of the basic “rights and freedoms” that will be celebrated by women all over the world on this day. As if that is not enough, they are also forced to endure the violence that is throughout the prison system. For these women, International Women's Day should be a day to promote better treatment of women in prison worldwide and keep us ever mindful and vigilant in eliminating the injustices, violence and harm inflicted on women who pass through criminal justice systems. Yesterday in Dallas, TX, groups representing criminal justice, civil liberties, policy, and faith organizations such as Texas Inmate Families Association and Human Rights and Grassroots Leadership, among others, gathered across the street from Dawson State Jail for a candlelight vigil to honor the women who have died while incarcerated at the jail. “We were pleased with the turnout. It is not about how many people showed up,” said Kymberlie Charles, the national organizer of Grassroots Leadership. Three women were honored at the vigil whose deaths could have been prevented had the correction officers at Dawson State Jail not ignored their pleas for help. Also honored at the vigil was a premature infant who lived only four days after being born in a toilet inside Dawson. The baby’s mother requested a pregnancy test just three weeks before giving birth but was denied by prison staff. The women, who died, along with the baby’s mother, were serving short-term sentences for non-violent offenses. When asked if this is going to be an annual event, Charles said “We hope not! Our point of this vigil is to get this place shut down.” Hopefully by next year this time, it will be closed. Neely’s conclusion proposes that stop-and-frisk is the only viable strategy “not because I like it or don't recognize the larger social problems at play, but because we must solve this problem now and I have seen no other solution that works. The price of doing nothing is more dead young people.” Research shows that, unfortunately, the implementation of stop-and-frisk doesn’t help reduce crime or save lives. Instead, it leads to the racial profiling and criminalization of Latino and Black individuals -- particularly the youth. According to the New York Civil Liberties Union, stop-and-frisk policies have led to illegal stops, the violation of privacy rights, and racial profiling. Nearly nine out of 10 stopped-and-frisked New York residents are innocent, according to New York Police Department accounts. Today’s post is reposted from the Youth Transition Funders Group blog, Connected by 25 Blog. It’s not often that individuals, organizations or politicians are on the same page. It’s hard finding common ground in today’s society that brings debate on civil rights, human rights and the right components for kids’ healthy upbringing, deterrence from “at-risk” behavior, and dealing with the aftermath of kids who become part of the U.S. criminal justice system. Luckily, for our nation’s youth, the John D. and Catherine T. MacArthur Foundation, Annie E. Casey Foundation, and Tow Foundation, have recognized the urgency and need to protect our children, even if they end up in youth detention centers. Each organization supports initiatives aimed at the work their grantees – like us at the Justice Policy Institute –are committed to in an effort to ensure better and lasting outcomes for justice-involved youth. Three reports were released on Wednesday, February 27, that delve into the dramatic, positive reforms that have occurred over the last three decades throughout juvenile justice systems across the country. The Casey KIDS COUNT report, released by the Annie E. Casey Foundation offers a data snapshot showing state-by-state youth incarceration rates for the last 38 years. The research in the two reports we penned: “Common Ground: Lessons Learned from Five States that Reduced Juvenile Confinement by More than Half” and “Juvenile Justice Reform in Connecticut: How Collaboration and Commitment Have Improved Public Safety and Outcomes for Youth” identifies the trend toward reduced use of confinement among youth in Connecticut, Minnesota, Arizona, Tennessee and Louisiana. Additionally, they provide context for these significant reforms and offer lessons to reformers in other jurisdictions can adapt and use in their own communities.